THERAPY DOGS NATIONWIDE came into being early in 2016 and is managed entirely by volunteers. 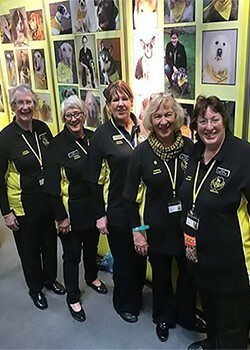 Our volunteers have the unique privilege of volunteering with their own temperament tested Therapy Dogs; some with over 10 years’ experience and always focused on caring for people in the community. Using animals, especially dogs, as therapy is not a new idea, they have been used for over 40 years in the care sector and many of our volunteers have roots with Lesley Scott-Ordish who was a pioneer in visiting with the concept of taking your own pet dog to nursing homes. Our volunteers have extensive expertise in many different aspects of therapy work with dogs. We frequent many kinds of establishments such as Schools, Special Needs Schools, Hospitals, Hospices, Nursing Homes, Care Homes, and Prisons. We visit with our calm, happy and temperament tested Therapy Dogs which gives us the opportunity to meet a vast array of different people from all walks of life, each with their own special problems, needs, and requirements. Some can be suffering from depression, ill-health or loneliness. It is not uncommon to find that many adults and children can be so afraid of dogs that it can affect their lives, we offer help by working with the professional medical sector to make a happier outcome in reducing and endeavoring to eradicate their fears. Therapy Dogs Nationwide have commenced our Paws and Read programme in Schools, where we work closely with parents and teachers to encourage their children to interact with the Therapy dog by reading them a story. This encourages them to communicate and feel comfortable around the dog. After all, our Therapy Dog is a good listener, never judges or criticises but just wags his tail, giving a natural and simple opportunity to help pupils improve their literary skills and behaviour, in a calm relaxed way by interacting with the dog. To find out how Therapy Dogs Nationwide began please visit our ‘How It Began‘ page.